New Directions are committed to continually evolving our recruitment and training services to our clients. 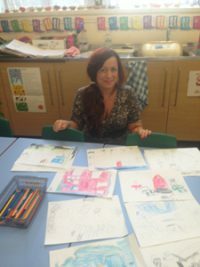 We work in partnership with a high volume of schools across the country and as part of our ‘Donate A Day’ campaign Gemma Hill the Account Manager for Caerphilly and Torfaen spent a creative afternoon in Cwmaber Infants helping children with their Art. The ‘Donate a Day’ idea has been championed by New Directions staff as a way of giving something back to schools whilst also allowing Account Managers to gain a valuable insight into school life. Gemma spent the first half of the afternoon in Year 1 where she worked with a small group of children drawing pictures relating to their topic of the Senghenydd Mining Tragedy. The second half was spent in Year 2 where the children were animating castles and dragons. Gemma thoroughly enjoyed the experience and was delighted that Cwmaber allowed her the opportunity to be part of their school community for the day. Gemma commented, “ I had a wonderful afternoon at Cwmbaer Infants. The staff were very friendly and welcoming. The children were fantastic and their knowledge and enthusiasm for their topics created some lovely work. I thoroughly enjoyed it and feel my experience in the school will help me in my role of providing them with the right temporary staff for their school”.